People For Bikes is looking for leaders who want to champion progressive e-bike policy in their home state! Working together with the Bicycle Product Suppliers Association, they’ve passed model e-bike legislation in 10 states in four years, modifying outdated e-bike laws to reach national consistency and prevent confusion from consumers, retailers an government officials. 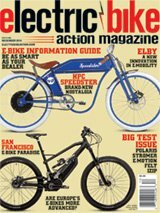 What is the process for passing an e-bike law? Who is a good candidate to be a state liaison? I’m interested in becoming a local advocate — what’s next? The webinar will be offered at 11:00 a.m. (ET) and 2:00 p.m. (ET) to accommodate a larger audience. Use the button below to register; the access link will enable you to log in for either session. advocatee-bike lawsElectric bicyclelawslocalPeople For Bikes Webinarstate level.